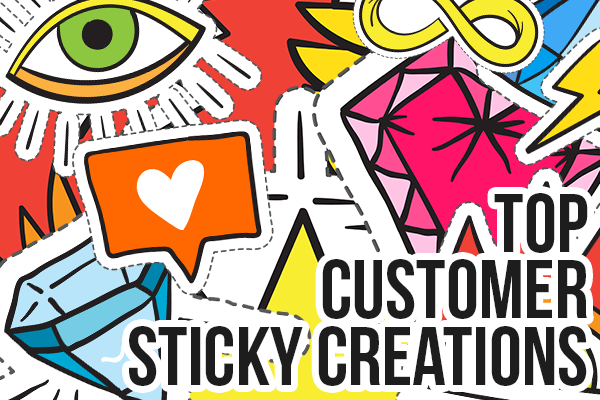 At StickerYou, we love seeing all the amazing and innovative things people do and create with our stickers. We’re constantly on the hunt on Instagram and other social media platforms checking out the inspiring projects our customers have tagged us in. If you’re a customer of ours, we’d love to see how you use our products! Don’t forget to tag us for a chance to be featured and shouted out on our Facebook, Twitter, Instagram, and more! The user @DesignedWithDelight created these adorable vector die-cut singles with motivational text. 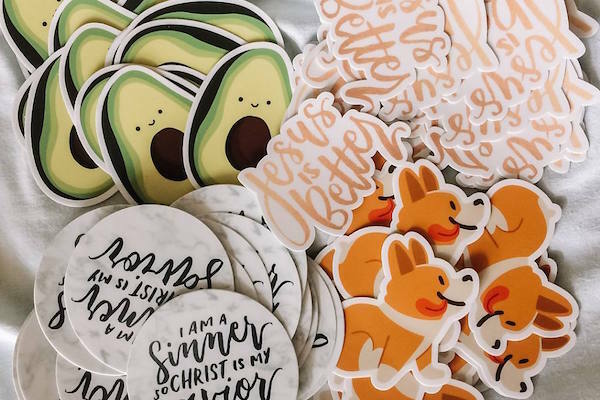 Stickers are a great way to express what you’re passionate about, and create designs that can raise awareness for causes and topics you’re passionate about. Not to mention, our white vinyl sticks to just about anything, so they can really end up anywhere! @FabledCreative consists of a creative couple that make awesome artistic designs and products. Not only this, but they’re also located in Toronto, Canada - we love our locals! They sketched and created this beautiful contour cut die-cut single. Although the talent speaks for itself, they ended up being one of our most engaged and top posts on our StickerYou Instagram. Lyn Sweet of @LynSweetArt is by far one of the most talented artists that we’ve seen work with us. 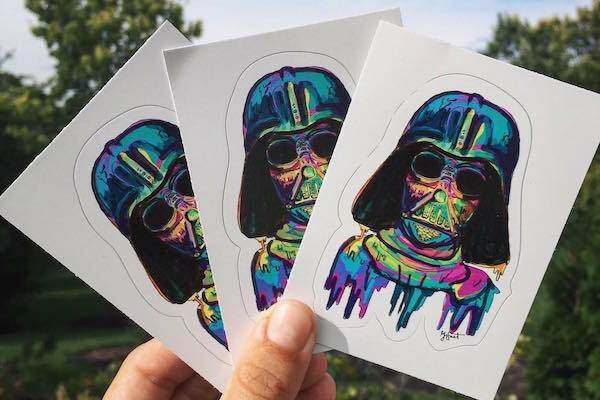 She created this limited run of trippy “I Am Your Father” stickers, using our kiss-cut removable white vinyl. We had to shout her out, as her artwork is our most liked photo ever on our Instagram page! You can never go wrong with Star Wars. Rage Against the Sandwich is a non-profit, private culinary club. Their mission is to redefine how we make and consume food. For every meal they make, a meal is also given to the community to help the homeless and those in need. 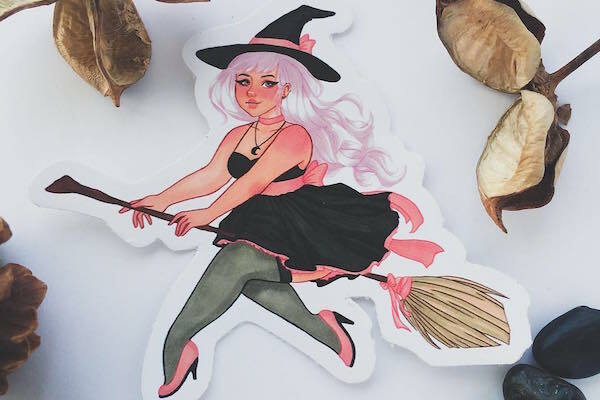 They created adorable trash pants roll labels that they give away to those that are interested in stickers! 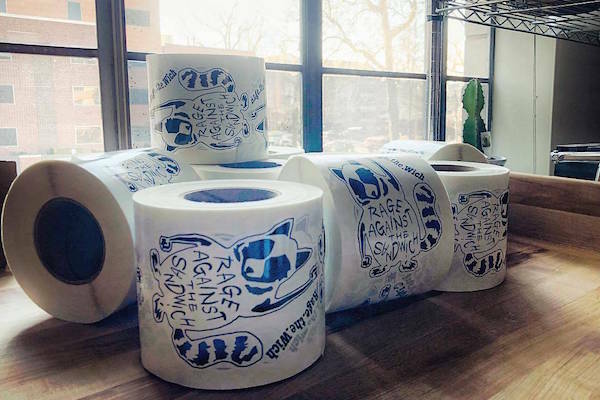 Check them out at @Rage.The.Wich. @RodgerJames, also known as “Beck” creates iconic artwork, often based in satire and political opinions. His artwork is definitely known across Toronto among the locals, as well as some of his political stunts and guerilla tactics. 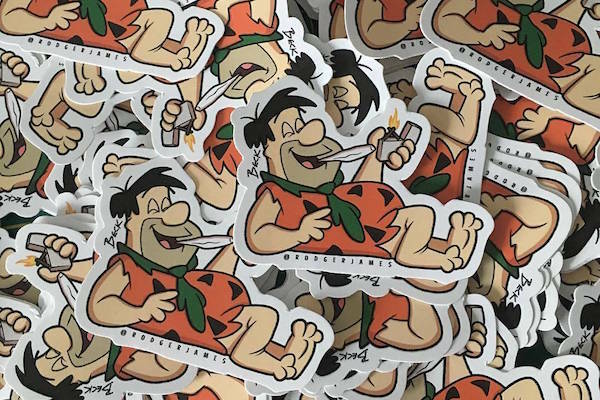 These Fred Flintstone 420 stickers, although controversial, were a huge hit among his fanbase, and ours! 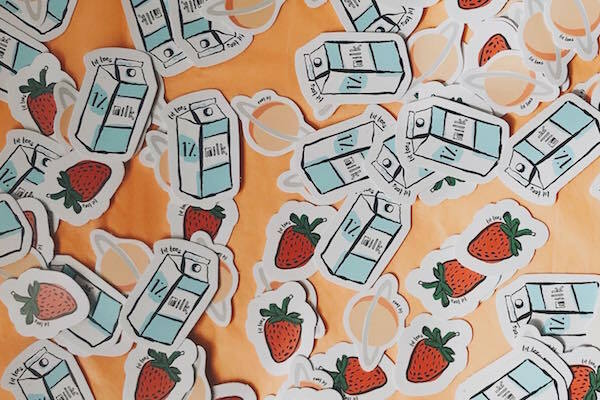 The folks at @Tit_Tshirts made these custom strawberry, milk, and saturn die-cut singles, and we’re obsessed! Partial proceeds from their clothing line goes to women’s healthcare, which is an incredible initiative. Our stickers are the perfect “gift with purchase”, and are an excellent way to get people excited about your products. Do you want to be featured on our next blog or social media? Tag us in your pics! We love engaging in your content and showcasing creations that we love. You can follow us on Instagram, Facebook, and Twitter to keep in touch!